A4 PERFORATED PAPER WITH CENTRAL PERFORATION. 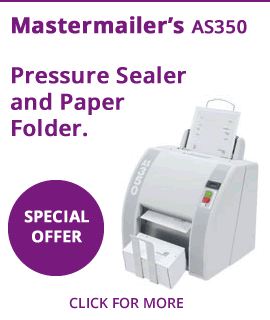 MAKES 2 A5 SHEETS. 90GSM LASER GUARANTEED PAPER. 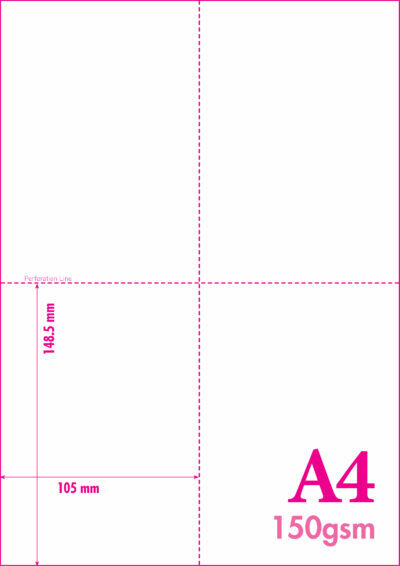 MAKES 2 SHEETS (1/4 and 3/4 A4). 90GSM LASER GUARANTEED PAPER. A4 MICROPERFORATED SHELF EDGE TICKETS. 70 mm x 38 mm tickets, 21 per page when separated. Carriage is free for orders over £40.00. SELECT PACK SIZE BELOW – The more you buy the more you save. A4 MICRO PERFORATED PAPER WITH FOUR PERFORATIONS. MAKES 8 x A7 CARDS. 120GSM LASER GUARANTEED PAPER. Each card is 105 mm x 74 mm when separated. 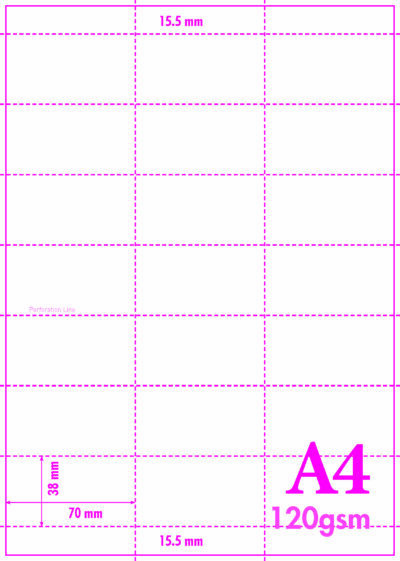 MAKES 2 A5 SHEETS. 120GSM LASER GUARANTEED PAPER. ALSO AVAILABLE IN PALE GREEN AND YELLOW. FREE CARRIAGE FOR ORDERS OVER £40.00. MAKES 8 x A7 CARDS. 150GSM LASER GUARANTEED PAPER. A4 MICRO PERFORATED PAPER WITH TWO PERFORATIONS. MAKES 4 x A6 cards. 120GSM LASER GUARANTEED PAPER. 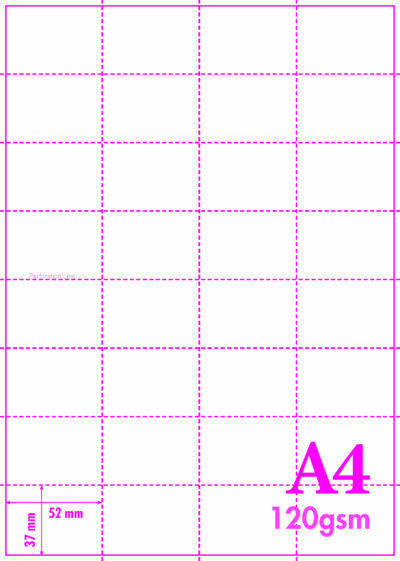 A4 PERFORATED PAPER WITH 2 PERFORATIONS. MAKES 3 EVEN SHEETS. 120GSM LASER GUARANTEED PAPER. A4 MICROPERFORATED SHELF EDGE LABELS. 52 mm x 37 mm tickets, 32 per page when separated. MAKES 3 EVEN SHEETS. 90 GSM LASER GUARANTEED PAPER. ONE A4 SHEET MAKES 10 x CARDS. 150GSM LASER GUARANTEED PAPER. Each card is 105 mm x 59 mm when separated. Also available in 120GSM. 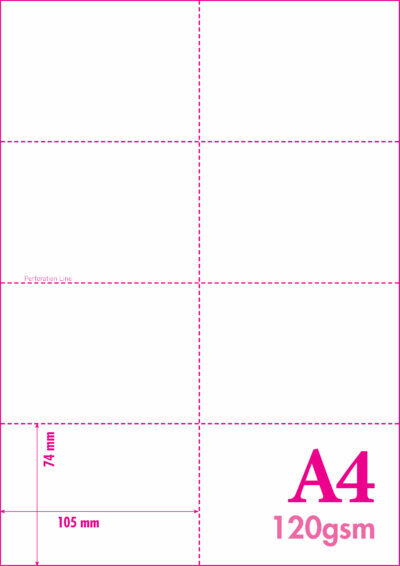 A4 MICRO PERFORATED CARD WITH TWO PERFORATIONS. MAKES 4 x A6 cards. 150GSM LASER GUARANTEED PAPER.